Genetics isn't as important as once thought for the evolution of altruistic social behavior in some organisms, according to a new insight into a decade-long debate. This is the first empirical evidence that suggests social behavior in eusocial species—organisms that are highly organized, with divisions of infertile workers—is only mildly attributed to how related these organisms are to each other. In evolutionary biology, fitness refers to an organism's reproductive success and propagation of its genes. When researchers at Hokkaido University studied the foraging and nesting behaviors of the eusocial species Lasioglossum baleicum, commonly known as the sweat bee, they found that the fitness was more a result of the bees' cooperative behaviour than it was a result of their genetic similarity. This evidence is contrary to earlier theories that attributed altruistic selfless behavior in eusocial species to genetic relatedness and a want to ensure the propagation of their genes. In some insect species, genetic similarity is higher between sisters than between a sister and its own offspring, and this has been considered the key driver to the formation of a eusociety. 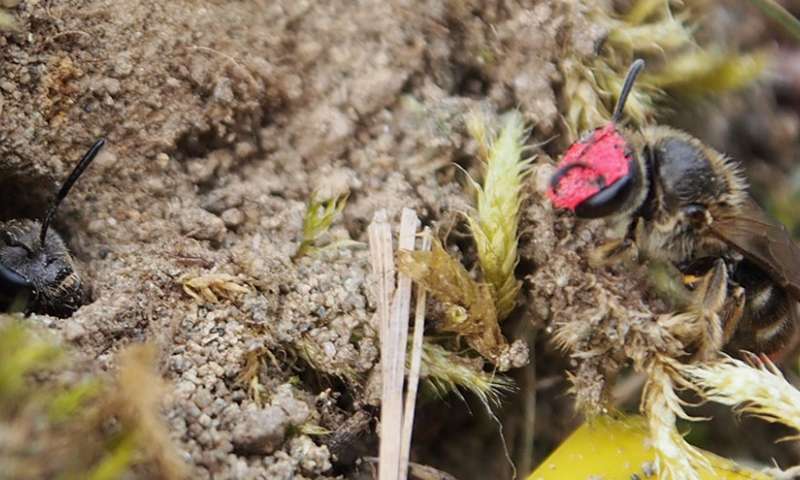 Evolutionary biologist Eisuke Hasegawa and his colleagues studied five aggregations of sweat bee nests in various areas on the island of Hokkaido in Japan. In each aggregation, there were two types of nests: those in which multiple females worked together to take care of the offspring of a single queen, and those in which a mother bee took care of her offspring on her own. Queen bees lay several eggs at a time. They hatch as predominantly infertile females, who grow to become workers. The team marked all the adult bees in the nests so they could identify them, then studied how often and for how long each adult female left the nest to forage over a 12-hour period. They found that the females working in the cooperative nests foraged more often than the females from the solitary nests. In addition, solitary nests were devoid of adult females much more often than social nests, leaving the nests more vulnerable to predators. Ants are the main predator of sweat bees. A female sweat bee protects the offspring in her nest from scout ants, which can recruit many other ants to attack, by plugging the nest opening with her head. This is why solitary adult females can only leave their nests for short periods of time. Cooperative nests, on the other hand, are more efficiently defended. The findings indicate that, contrary to previous theories, the main contributing aspect of fitness in a social nest comes from the benefit of grouping. "There has been a decade-long debate among scientists as to whether genetic similarity or the benefit of grouping is the primary drive of sociality. Our study could help reveal some of the factors behind the evolution of cooperation, including among humans, by quantifying how much cooperative behavior contributes to the increased fitness of altruistic individuals in a group," says Hasegawa. I find the article problematic. They speculate in fitness differences, but do not attempt to uncover a genetic template which invalidates their model. On the contrary they observe that the socially polymorphic bee makes situational social choices, which trait may have evolved for any reason including drift. I do not know if phylogenies uncover it as a putative heritable trait, but it is possible since the data suggesting population wide mechanisms is meager and not tested against a random null hypothesis: they note "36.4% of eusocial colonies contain at least one unrelated adult female (23)".